A trained teacher, Nat is one of The a.r.t. of Fulfilment creative team as well as a facilitator and trainer. 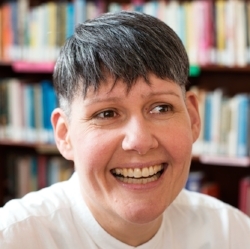 Nat has taught Buddhist classes at Jamyang Buddhsit Centre, Mindfulness-Based Stress Reduction (MBSR) at the London Centre for Mindfulness, and general mindfulness classes for over 6 years. Nat is an accredited facilitator and trainer for The a.r.t. of Fulfilment Level 1 delivering courses in English. Nat is also a performer and is currently a ‘Giggle Doctor’ with children in hospitals.